These chicken tenders are so good! 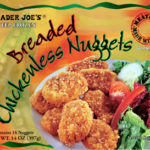 Way better than I would expect any type of frozen chicken tenders or nuggets to be. The meat was very tender and juicy – not at all tough or jerky or gristley like a lot of frozen chicken. The breading was flaky and soft as well. 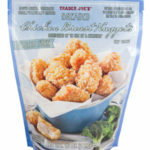 The chicken tenders really did taste like they could have come from a restaurant – great with TJ’s ketchup and buttermilk ranch! 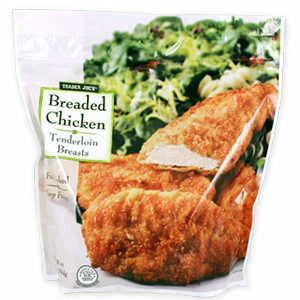 I really enjoyed these chicken tenderloins, especially the inside. The meat tasted really good quality. I also liked the breading, though I would have liked it even better if it were a little more thick (like crunchy KFC-style breading). Its delicious, but I wish you made them with out Soybean oil. As studies have show Soybean oil good for you and there are many Soy allergies., yet its in everything. So I have stopped eating this product. 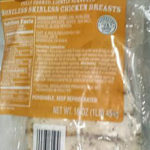 Tyson brand chicken strips does not contain this product. 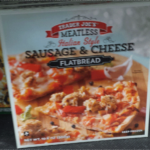 sad that trader Joes does. ), breading set in soybean oil. 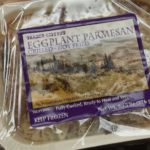 Been buying for years…..much better than that Tyson or Purdue crap…..my only complaint is that 1 out of every 3 or 4 pieces comes with tough, rubbery skin in there, it’s so gross….’c’mon Trader Joe’s, why can’t you clean up the chicken better? I used to love these and eat them several times a week (so good). But the last three bags I’ve purchased have a strange flavor (burnt or Smokey) i’m Hopeful this is a bad batch and not intensional, because the new flavor makes them un-eatable for me.